The 3 Call and Ride zones are also indicated. I noticed the only route that connects at Rosemont is the 605. Does PACE think that the majority of riders are not connecting with the L at Rosemont to explain the 604, 607 and 608 only going to NWTC? One has to consider that 600 runs to NWTC, and its schedule probably will be beefed up (it was recently changed to bidrectiontional instead of an interline with 606). The Palatine and Addison buses are clearly feeders. If someone were going from either location to downtown, they would already be taking Metra. The impression I got of 605 and 607 was that they were alternatives in that one would take the NWTC bus if the Rosemont one isn't running. However, I might be wrong about that and maybe the theory is that since Schaumburg is its own business center, there is sufficient traffic between the Elgin area and Schaumburg, although one wouldn't know that from route 554. The indications of the Elgin routes are only to show what existing routes will connect to the proposed "stations." Of course, some Elgin residents have the problem of "sin seguro y licensia." Pace must also figure that the Call and Rides will generate traffic, or at least convinced the feds to give them a CMAQ grant to pay for it. Finally, the indications were that there would be special bus ramps from the Tollway to the "stations." The commuter parking lots will be located so as to give the buses easy access to the tollway from existing ramps. At the Barrington Road interchange, which is being rebuilt, bus-only ramps are planned, and a new pedestrian walkway will give commuters access to the bus stops. Metra alone into downtown from Palatine or Addison would seem not to be enough at 1 to 3 hour headways with BusHunter mentioning that Rosemont Blue Line station is still seeing heavy passenger traffic interchanging between CTA trains and the current Pace express buses that are already there especially during the height of rush hour. 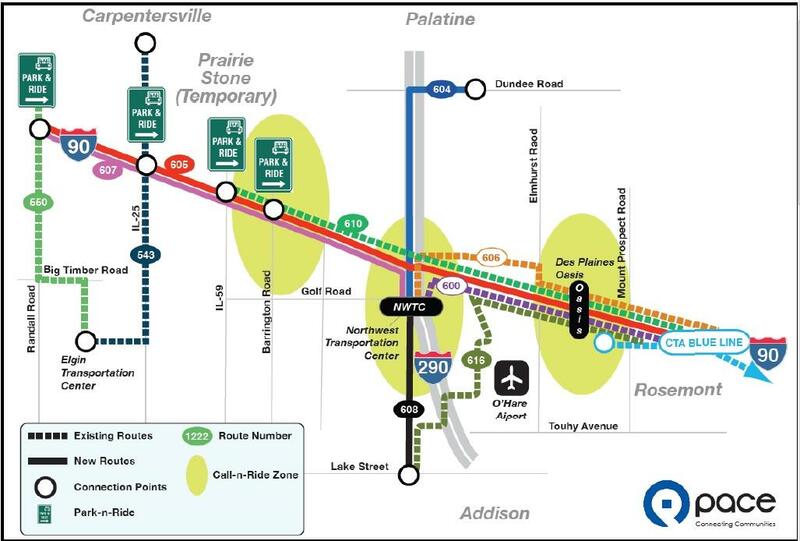 If that's true, it sounds like Pace is underthinking the situation by only having 605 connect with the Rosemont station and having 604 and 608 be feeders instead of I-90 express lines if that map is indeed being interpreted correctly. Plus remember not everyone who's transferring from the current express buses to the Blue Line is riding all the way into downtown. They're going into other nearby NW suburban locations and other points inside the city other than downtown Chicago. UPDATE: That Trib article pretty much confirms that only 605 and 607 will be actual express routes with 605 being the only one going to Rosemont while 604 and 608 will be feeders to/from NWTC. Wider shoulder or intelligent traffic management were mentioned in the articles. On flop, I figured that 699 was, but maybe there is synergy with more other routes into NWTC. Still, I don't necessarily see Park and Ride lots in Addison and Palatine, nor the attraction of one. Traffic on Ill. 53 gets backed up, too. Wow that's some seriously bad traffic on that stretch of the Kennedy if you passed a #282 while on the train to O'Hare and then passed that very same bus when coming back EB on the train. Considering the train ride between Jefferson Park and the airport station is 14 to 15 minutes, that's a minimum of 30 mins you could have been on the train to the airport and back assuming you got on at Jefferson Park. Wow. You learn something new everyday. These days most rides I take with anyone on the Kennedy only are to get to the Edens going somewhere else, so I don't really physically see or experience how bad traffic gets on the Kennedy west of the Edens or along the tollway stretch of I-90. I wonder for the 23 buses will they be ordering coach style buses or something more down to earth? TBA: the I-90 buses will be wrapped, the feeders will be in the regular rotation. The objective is connectivity. Just because you have a slew of routes, the goal is to get people to Schaumburg or points south. Sometimes, you have to look at the overall travel patterns between the inter/intra suburban travel. And there are costs associated with running a bus from Palatine/Addison to Schaumburg (especially if there's not a single route from either direction. Unless you extend the 616 from Itasca, you've nothing to connect from the south. Elgin to Schaumburg is it's own entity (and there is some demand at Schaumburg to justify). Capacity at Rosemont and you have separate services for each different market. Not to mention utilizing existing services to be more effective in making the routes work (see 543 and 550). Some of the inbound 610's in the morning actually have gotten ridership lately. Route 755 and 850's already do this. It's not much different in this case, other than the 600's aren't going all the way downtown. I believe that's an operational change since you might lose time at Mannheim and the 190 bypass…especially since the work at the airport is very junky for the time being. The routes are already suffering OTP issues because of the WB issues and traffic shifts. Shifting traffic to Higgins wouldn't make too much of a difference (especially the bridge replacement has begun at Higgins and elmhurst). Probably where BusHunter is going is whether 605 607 will be MCI or Axess Express (it being previously noted that the Capital Plan was amended to include 23 buses). My guess (based basically on how 610 755 855 877 and 888 are set up) is Axess Express unless the trips from Randall Road are premium fare. I also assume that MCIs have greater passenger capacity. There are certainly enough options for either. They definitely will be wrapped (or MCIs will have the "Authorized to Operate on the Shoulder" graphics) because the State Police insists on that for shoulder operation, and shoulder operation has been indicated for the I-90 project. Additionally for marketing purposes. Gives the sense of the existence of these buses. But apparently they haven't wrapped 610 yet, and putting Axess buses on that route was part of this project. If you mean something like the Solder Field Express buses, those wraps are not that good looking, and diluted by the buses being used on normal routes. The marketing probably would be something like used on I-55, such as advertisements in gas stations, and the "he's not authorized to ride your shoulder" TV ads. Those 610s, while I personally believed they should've been wrapped when they restructured the route last year (again, marketing purposes and not so much the shoulder construct), should be wrapped in '16. So then technically a cubs roundtripper (#282) cannot use the shoulder because it is not wrapped to give it shoulder authorization? I wonder why they use MCI's for this riding on the shoulder service. Is it because they have a beefed up suspension that can take the abuse of the highway? To me they seem clunky and too big and they seem to have slower transmissions. Now i can understand Greyhound having MCI's because the passengers have luggage. But I doubt that's the case here unless they were running trips to the airport. Why don't Pace try to get some premium city/highway transit buses like the Nova Classics and just have no rear door installed making them officially highway buses or leave the rear door on and use them as extras for the garage fleet. Isn't it hard to maintain the lift on the MCI's versus a low floor, plus would the bus cost less? Your first point is correct, in that besides not being wrapped, the overhead signs on I-55 aren't on I-90. Furthermore, I-55 was recently reconstructed with wider shoulders, no indication that the Kennedy Expressway was when it was reconstructed something like 20 years ago. Undoubtedly, the crossovers between the local and express lanes also prevent BOS operation. The rest of what you say makes no sense, especially since Pace has 15 Axess Express buses.Now why they put only 2 on I-55, I don't know, but I am sure that the reason that I-55 has 13 MCIs is to provide the premium service advertised. On the other hand, the pheasants in the South Suburbs now have to ride Axess Express buses from Oakbrook, but, again, there may be is question that the seating capacity of an MCI is no longer needed. The point I'm trying to make busjack is that if as you say the nw tollway will have bus only equipped shoulders why couldn't all buses that use that portion of the tollway have access to it? Then the debate of axess' vs mci's I think is a legitimate one. What is the difference between the two on mci's you have to climb stairs and wait for another bus should the handicap ramp stop working. More probable on a high floor. Then Pace is paying for the luxury of a coach, city to major city, liner. Is there something I'm missing here? But maybe you should call Melissa Metzger and ask why Pace bought both 6950s and 6377s. And unwrapped buses will not be allowed (by the State Police) to use the shoulder. So, to get to MetroShadow's point, eventually those on 600 and 610 will have to be wrapped, but probably not until the reconstruction project is over. Well, the 855 pretty much has had coaches for as long as I can remember. Until recently( within the last couple years) contractors ran their own coaches. Considering Bolingbrook is about 30 miles or so from downtown Chicago, I guess the thinking would be to provide a comfortable service (reclining seats, etc) for passengers to entice people out of their cars. Who would want to ride on buses with hard plastic seats for that long? The lowly southern suourbanites only have to ride to ride the tollway about 15 or so miles, plus they still get more comfortable seats. I don't know what Bushhunter has against motor coaches, but they bring an appeal that transit buses don't, no matter how one tries to dress it up to be like a motorcoach. Just ask the Google employees who ride coaches to work everyday. Look on Youtube and you can find videos of commuter motorcoaches loading and unloading at the Port Authority Bus Terminal. You won't find transit buses doing that. As long as the lifts are cycled on motor coaches everyday, the lifts work fine. Getting needed parts for MCI is easy, especially since they have a facility in Desplaines. Like I've said before, motor coaches last a very long time. There are a lot of 30 year old motorcoaches still running around and still running over the road. If Pace owns any motorcoaches, they can get some value for it, however coaches with lavatories have more value. isn't that all on an axess premium? Umm the coach style seats can be installed inside the Axess Express models if that's the main argument for going with a high-floor coach over a more traditional transit style bus built to operate on a highway and one wants to go from a comfort point of view. Sound Transit's NF DE40LF #9200 proves that. If Sound Transit, which operates express bus routes that connect the Seattle-Tacoma area with the rest of King County as well as nearby Pierce and Snohomish Counties in Washington State, can buy transit buses with seats that aren't the hard plastic types it is possible for Pace to do so to operate its longer distance express routes that do reach 30 miles plus. Speaking of 855...Alerts should be out in the next week or so. ...it is possible for Pace to do so to operate its longer distance express routes that do reach 30 miles plus. Art is the only one that seems on point, i.e. why motor coaches are used on long haul routes, although not the answer why they were replaced on 877/888 by the apparently impossible Axess buses with high seats. Like I said, ask Melinda Metzger.